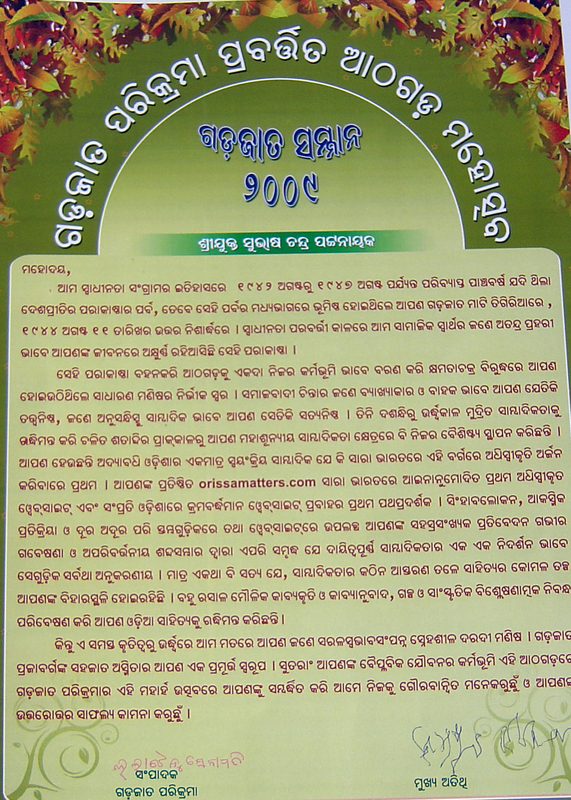 The eldest amongst the living freedom fighters of Athgarh, Duryodhan Jena, 102, conferred “Gadjat Samman-2009” on the Vice-Chancellor of Utkal University, Prof. Binayak Rath and Representative-in-Chief of orissamatters.com, Subhas Chandra Pattanayak on December 13 on commencement of the 4th Athgarh Mahotsav organized by Gadjat Parikrama. Both Sri Rath and Sri Pattanayak belong by birth to Ex-Princely States of Narasinghpur and Tigiria respectively. The other two selected for the honor which would be conferred on them on the concluding day of the festival on December17, are the unique story teller Bhramarabara Moharana and Ms. Padmini Raut, winner of Gold Medal in the ‘World Under 14 Girls Chess Championship, 2008’. Both of them belong by birth to Athgarh and Baramba respectively. The citation in honor of Prof. Rath expressed happiness of the peoples of the Gadjats (Ex-Princely States) over his worthy contribution to higher education and economy of industrialization vis-à-vis social benefit cost. 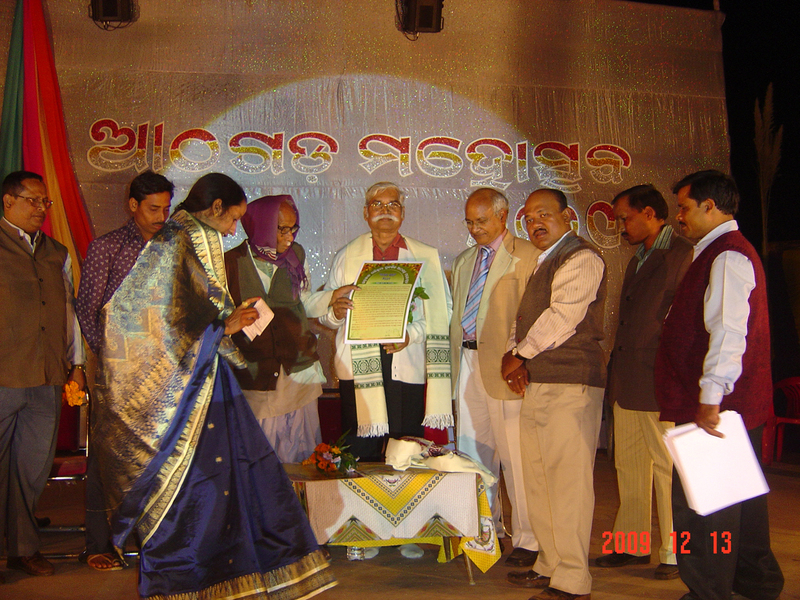 Sri Pattanayak was honored as a pioneer of next generation journalism in Orissa who in print and internet media has made splendid contribution to democracy as well as to culture and literature of Orissa. Lalatendu Senapati, Secretary of Gadajat Parikrama and the chief executive of Athgarh Mahotsav welcomed the guests and gave an account of the event. Ashoka Dash, a leading light of the organization proposed vote of thanks. An exhibition of creative excellence participated by artisans and weavers of the Sub-Division of Athgarh along with products of self-help groups displayed in 52 stalls as well as entertainment through local musicians, singers and dancers added desired luster to the festival.